Recently I was on Pinterest and saw this.. My face doesn't break out often but I though this chart was pretty cool. It called Face Mapping.. and it pretty much says different parts of your face are connected to different parts of your body. I checked it out.. and it seems pretty accurate! You can find the full post over at TheBeautyGyspy.com!! I think this could be pretty accurate.. check it out for yourself and see if things don't improve! 2 comments on "WHAT IS YOUR ACNE TELLING YOU?" Very interesting post. 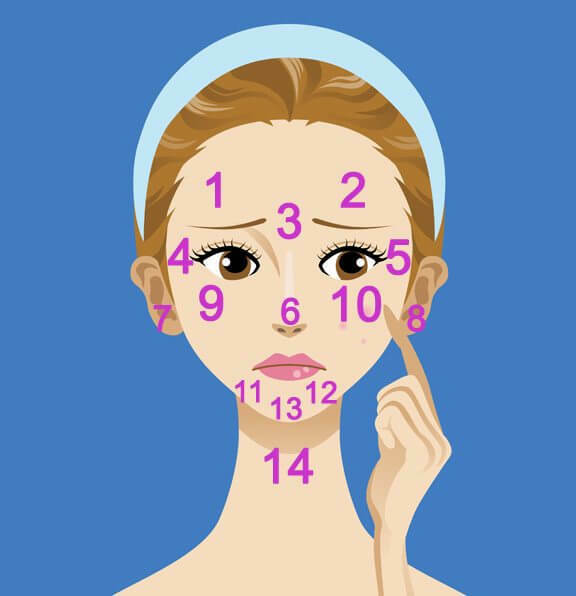 My sister have an acne problem and I'm sure she will find this info useful. Sharing it on facebook now. Also, am ur newest follower. Hoping from Aloha Friday to visit u. @ Honeybee..I thought it was interesting too! Thanks for sharing! I follow you too! Have a great weekend!